Fried pickles are a wonderful thing on their own, but if you stop by here often you know that I love to combine different flavor profiles and dishes together. So flavored fried pickles have become one of my favorite things to experiment with! 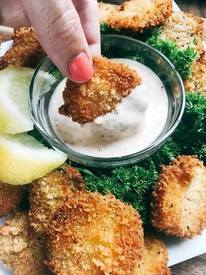 Smoky Chipotle Ranch Fried Pickles have a spicy kick from the chipotle chile powder with the tangy ranch. A little lemon brightens it all up for a fun and unique appetizer or snack! They are perfect for game day, parties, and entertaining like a BBQ or summer grilling event.